High Road Strategies, in collaboration with the Millennium Institute, conducted a groundbreaking two-year study to examine the climate change policy responses available to Congress and the Administration to address the competitiveness concerns of U.S. heavy manufacturing industries, labor unions and others. Employing sophisticated system dynamics economic models, the High Road Strategies-Millennium Institute team assessed the impacts of a moderate-priced U.S. green house emissions trading system (i.e., the Lieberman-Warner America’s Climate Security Act of 2007 (S. 2191)) on the competitiveness of five energy-intensive manufacturing industries—iron and steel, aluminum, paper and paperboard, alkalies and chlorine, and petrochemicals—that are among the largest industrial consumers of fossil fuels, and emitters of greenhouse gases, in the American economy. The study, funded by The National Commission on Energy Policy, also explored options to offset the energy price impacts through investments in low-carbon technologies, and cost-mitigating policy measures such as an allowance allocation to offset the added carbon-based costs incurred under a cap-and-trade system. Climate policies that impose a modest-to-high cost on carbon-based energy sources would increase most of the energy-intensive industries’ production costs, reduce their operating surpluses and margins, and potentially shrink their domestic market shares if no actions are undertaken to spur investments or mitigate the additional cost. Since these industries typically are constrained in their ability to pass along domestic policy-driven energy costs (because of international competition, market conditions, the nature of their markets, and other factors), they likely would feel increasing pressure to take actions to reduce their costs and prevent their profitability from decreasing in response to a climate policy. The adoption of both readily available and more cutting-edge technologies needed to achieve energy efficiency at a large scale could offset increased costs and generate additional profits. While most of the industries are exploring energy-saving technologies that could mitigate these impacts, they face financial, technological, and other limitations (such as the age and sunk costs of their existing equipment) on their ability to successfully invest and adopt these alternatives in the near-to-mid-term. An allowance allocation policy that substantially offsets energy cost impacts, at least through 2025, could provide time for these industries to make the adjustments and energy-saving technology investments required for maintaining their domestic production capacity and competitiveness. 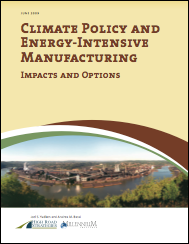 The results of the study are summarized in a report released June 2009, entitled Climate Policy and Energy-Intensive Manufacturing: Impacts and Options. The report includes an overview of the project, summarizing its methodology and principal findings, several chapters with in-depth analyses of the iron and steel, aluminum, paper, and chemicals (petrochemicals and alkalies and chlorine) manufacturing industries, and a technical appendix. The latter includes a literature review of related studies, a detailed description of the study’s methodology, and a summary of alternative scenarios and sensitivity cases modeled in addition to the core policy cases. Printed copies of the report and executive summary also are available for only shipping & handling costs. Contact us directly if interested in placing an order.